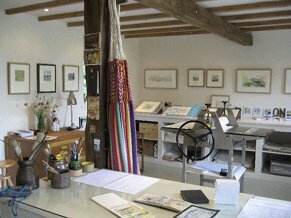 The studio at Healey Mill is a unique and inspiring place in which to work. Its rural, riverside location offers a wealth of subject matter. The studio itself is a bright contemporary space, on two floors, in what used to be a stable and granary. 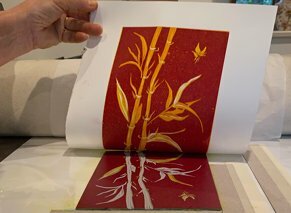 The printmaking workshop is equipped with a Bewick and Wilson etching and relief press, which is highly geared and therefore effortless to use. It's a great space to work in. With fifteen years experience teaching undergraduates behind me, my own workshops are designed to give you the confidence to go on and develop your own printmaking skills. See below for some of the student feedback we have received from previous worhsops. If you have a group of friends who would enjoy spending a day together printmaking, and having lunch, or 'a hen day' perhaps, contact me to talk about your plans. 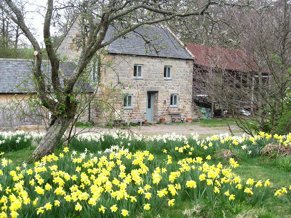 The studio is situated 1.5 miles outside of Netherwitton village, 9 miles west of Morpeth from the main A1, only 3 miles from Northumberland's National Park. Click on this link to see a map. If you would like to give a workshop as a gift, I now have gift cards with a voucher to the value of your choice. If you would like to talk to me about this gift option please contact me. "I am so grateful for the experience you gave us. We couldn't have asked for a more enjoyable day. The setting in your beautiful studio and the delicious lunch in your beautiful kitchen just made it even more lovely." "I think I can easily say on everyone's behalf that we had a wonderful weekend learning with you. We were all inspired!" "Thank you for such a lovely day and for sharing your home and studio with us. I really enjoyed the day and the beautiful lunch you provided".